Wishing for some snow, so white! Have the wish I wish tonight!" To have a little snow and ice! I'd create some nice figure eights! Spinning, twirlin' 'round, oh so quick! Their home becoming the Klondike. For me, my family, and the rest. I wish good days for one and all! are not yet tall enough to reach! What a wonderful treat to awake to! 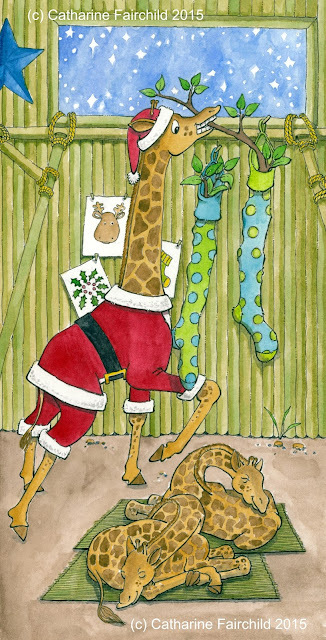 This is my favourite, so far, in my Stocking Stuffing series! I discovered, while researching how giraffes sleep, that they sleep for about 4 hours a day! and they curl their neck around to rest their heads on their hind quarters! These li'l giraffes were SO much fun to draw! All curvy lines and knobbly knees!! And spots!!! a giraffe, I hide a heart (or two!) somewhere among their spots. I love hiding hearts (when I can) in my artwork! Can you find the hidden hearts on these giraffes? I will join with the li'l giraffe in wishing good days to one and all!